I am grateful for the uplifting words of 2 Thessalonians 2:16-17. I read them this morning during my devotional time and that was a very good thing. For you see, I had read earlier in the morning from the book of Jeremiah about the ominous warnings that God had given to rebellious Hebrews listening to the egocentric teachings of the false prophets in the days before the Babylonian destruction of Jerusalem. It is disheartening to consider that so many people who should have lived surrendered, Spirit-led lives for God were instead obsessed with doing the exact opposite. It actually sounds much like what is happening today in our world, including the portion of Jeremiah’s book that spoke of prophets saying what the people wanted to hear rather than calling them to repentance. Listen, God doesn’t want people to suffer and that’s why He is not only a God who loves, but also a God who warns. When we listen to His warnings in the Word or from the voice of His Holy Spirit calling us to godly living, life is SO much better for us, for those around us and for His Kingdom. Never forget that we were created by and are to serve a marvelous Abba Father who loves to show mercy rather than punishment. Let’s remember all the good that God has done for mankind and for us individually. Let’s remember the good that God has done through us on occasion. And then let’s strive to do more good with our actions and words. Our hearts will be comforted as a result. When I was a kid, we had for a brief time an inflatable punching doll around the house as a fun activity. 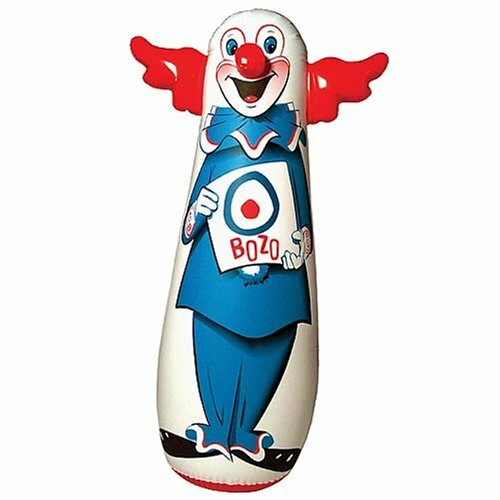 You’d punch Bozo in the nose and he would fall over. Immediately, he’d come right back up for more. Why? Because the perimeter of the base for the 46″ inflatable doll was weighted with sand and gravity would pull the side of the base back down, lifting the head to the upright position. The photo below illustrates the design. If your email program blocks the picture, click here to see it listed on Amazon.com. So why talk about Bozo this morning? Consider this verse from Proverbs 24:16…. You and I have tripped spiritually far more than seven times. And we’ve been knocked down more times than we want to remember. Trusting God for strength and wisdom, though, has helped us get back on our feet. We might have less money afterwards. Or less physical capacity. Perhaps we have fewer friends. But as long as we have the solid foundation of faith in Christ, we’ll always have help to get back to a spiritually upright position. Yes, some in this world will treat us like Bozo the Clown. But, like him, we’ll always be put back on our feet as long as we hold onto God’s hand. Morning Devotion: What motivates God? Embedded within the verses of Ecclesiastes 3 is a potent, little sentence that can sharpen to a razor’s edge our focus of life. It speaks not about us, however, but instead about God. This was written by Solomon, deemed by scripture as the wisest man in history other than Jesus. And this was written after Solomon had forayed into random detours of fleshly foolishness. The greatest king Israel has ever known concluded that all of God’s efforts in creation, in inspiration, in intercession, in revelation, in correction and in reconciliation were all focused on one objective — the salvation of people through faith in Him. Ecclesiastes 3:14 is a wonderful companion verse to John 3:16, a verse you already know. Ecclesiastes 3:14 is also a great verse to share with 2 Peter 3:9, another well-known verse that teaches us of God’s patient desire for all people to be repent of their sins so that they might gain salvation into eternal life. You’ve heard that the “whole duty of man” is to fear God and keep His commandments. This is not in scripture because God is a control freak. This is in the Bible because God wants us to follow the safe path that gets us where He wants us to be forever — in His presence in heaven. If it is God’s purpose for people to fear Him in the sense of loving and obedient respect, it is to be our purpose for living, as well. Let’s show people that we love, obey and respect our heavenly Father so that they’ll see the fruits of a better, more emotionally secure, meaningful life that can be theirs as well. It really is a Great Commission thing, you know.